Maiden kicked off their Final Frontier World Tour last night in Dallas, Texas. The set, like almost all album tours Maiden have undertaken for the past 10 years is mostly comprised of new material. Off course they have thrown in two tours of just classic material….but they didn’t bring the last one, The Somewhere Back in Time Tour to Ireland and that was the one everyone wanted to see. Now, like 2006, we’ll be forced to sit through a long set of pretty crappy rehashes of their former glory days in the hopes of being satisfied by the usual 5% cut of their classics. Obviously no-one’s got a gun to heads but come on! I just realized I never updated this post after Ronnie James Dio’s passing last month. No replacement support act has been confirmed by MCD, Ticketmaster or Iron Maiden themselves. If anythings announced we’ll post it……although, filling Heaven & Hell’s shoes would be almost beyond impossible but just in case. Unfortunately Ronnie James Dio hasn’t fully recorded yet so all summer appearances by Heaven & Hell have been cancelled. Iron Maiden is still go though. Tickets There wishes Ronnie a speedy recovery. As a friend just said, ‘Dio can take as long as he likes’ and that’s for damn sure!! Don’t be rushing back too quickly Mr. Dio, we want to see the legend in his purest form. Event has been posted on Ticketmaster. 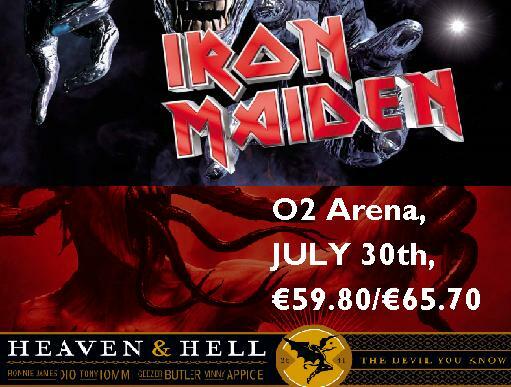 Legendary British Heavy Metal giants Iron Maiden and Heaven & Hell are coming to Dublin…together!!! This will mark Maidens first Irish show in four years after their last appearance in Dublin’s Point Theatre in 2006. Heaven & Hell…wow, Ronnie James Dio is coming back strong after health problems and Dublin will be bowing down to give the metal god his proper respect. Last year, Tickets There pushed for the legend to visit the emerald isle and it seems to have worked. Click Here to see 666 Reasons Why Dio Needs Dublin. Details found @ Metal Ireland. This entry was posted on April 9, 2010 at 7:58 am and is filed under Music, News with tags heaven and Hell 2010, heaven and hell 2010 dublin, heaven and hell dublin, heaven and hell ireland, Iron Maiden Dublin 2010, Iron Maiden heaven and hell dublin 2010, iron maiden o2 dublin, Iron Maiden the o2 2010. You can follow any responses to this entry through the RSS 2.0 feed. You can leave a response, or trackback from your own site. is there any limit of Age ..??? would be ok if i take my 15 years old child …?? Generally there’s a restriction that Under 16’s have to be accompanied by a parent or guardian. Normally these details are on ticketmaster.ie or MCD’s site but I don’t see anything so I’ll let you know on Friday when I get my tickets. Should say on them. Still haven’t gotten my ticket for this one, can’t afford now until Late May. Anyone else got one yet that can confirm? No official word yet Daniel. Rob Halford is being lined up to sing vocals for Heaven and Hell for Ronnie’s tribute concerts but all current H&H shows are canceled and neither Iron Maiden or MCD have announced a replacement. W’ll post it as soon as there’s news. I checked the other day and they look sold out. Try Sound Cellar in Dublin, they generally have tickets after everyone else sells out. Wayyyy too much, hold off and call Sound Cellar tomorrow. They’ll have them for face value. aaaand .. it will sound like i m idiot 😛 but do you know where i can find their number? I’m afraid Sound Cellar is sold out of standing tickets for Maiden aswell :(. Maybe try metal Ireland’s forum, that’s where i’ll be looking. Hi guys I have 4 standing tickets for sale at face value. email me for details, dont want to put my number on here. I was dragging a couple friends along as I’m a big Dio & Sabbath fan, not into seeing Maiden again. Hey guys, one standing ticket for sale. I was hoping to see the mighty Dio and I’m not that big a Maiden fan to go just for them. Email me with offers. If anyones interested in this, send an Email to ticketsthere@hotmail.com and we’ll forward your offer onto PirateDel. We didn’t I’m afraid, we’re waiting for Maiden’s next greatest hits tour. Enjoy it man!